On your Apple and Android phones and tablets! Now you’ve got all the optimal features of our websites and dealerships at the touch of your finger. Your Personal Profile: By scanning or manually adding your VIN (vehicle identification number), your car is saved in The BMC App to make life just a little more convenient. Service in a Pinch: Getting roadside assistance, scheduling car service, searching through your owner’s manual, or even finding the nearest gas or parking is now as quick and easy as can be. The Right Dealership: Pick your applicable dealership and you can check inventory, make a payment, get directions, or even just call and check in. Need to visit our main website or access our sales, service, or parts departments? Just a click away. Get Social: Find your dealership’s Facebook, Twitter, Instagram, and other social media pages from The BMC App. What better way to let us know how much you like our new app? Quick and Easy: Just search “Bernie Moreno Companies” on your App Store or Google Play (for Apple and Android gadgets, respectively) and download. 100% free, of course! You may not be able to download cars yet, but a dealership in your pocket? It’s the next best thing. 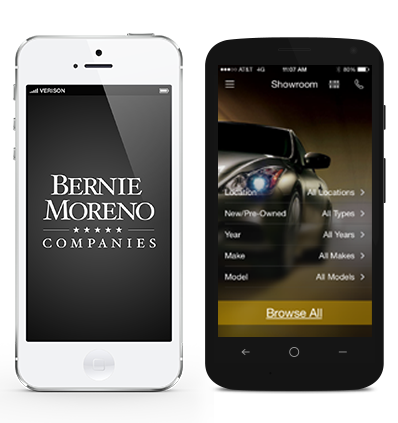 Get The Bernie Moreno Companies App for your iPhone, iPad, and Android devices today! Application will only work with Wi-Fi or wireless mobile connection. Data rates may apply.